I could only answer that when I met with more than 100 ragpickers along the border last year between east Delhi and Uttar Pradesh, the leaders wanted to talk to us for a minute after the meeting. They had two primary concerns: (1) that their livelihood not be privatized, and (2) that a teacher be found for their children so that they could learn after work. Families desperate for survival try to balance these issues delicately. They have to eat, but they also want to feed their minds and their futures. They cannot be sentenced to starvation, when there is no adequate public support that provides a floor against deprivation, as is the case in India, but all needs must be balanced. The ILO’s call for a war against such conditions may be the right message so that families no longer have to watch their children face the same wants in their futures that they have faced in the harsh reality of these times. 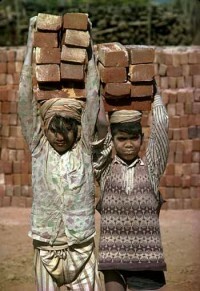 This entry was posted in Financial Justice, International and tagged child labor, Day of War against Child Labor, International Labor Organization by wade. Bookmark the permalink. When a child is put to work before he is educated and socialized his first life lessons will come from an authoritarian, abusive, hateful, uncaring boss trying to wring everything he can from the child. The child will learn how to fight this kind of authority or he will learn how to debase himself before authority. That knowledge will stay with him his entire life. It is always better to educate him first or at least simultaneously so he can have some way to understand his plight.